Technical details on how the blade oscillator works, and the new experimental escapement system. As promised, we get the next installment of the unfolding saga of the Dominique Renaud’s new brand and watch. Today we release information and technical details: Dominique Renaud DR01. 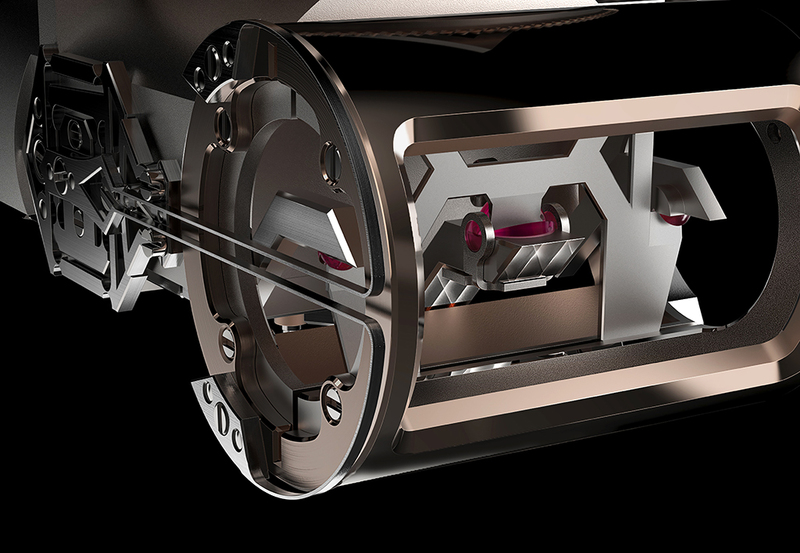 Details on the new escapement which will be offered in a new watch to be called TWELVE FIRST. We brought you the preliminary information of this revolutionary new movement here. And the first visuals of how the watch will look like and our initial impressions and early analysis here. We highly recommend you read both of those articles first before attempting this one. 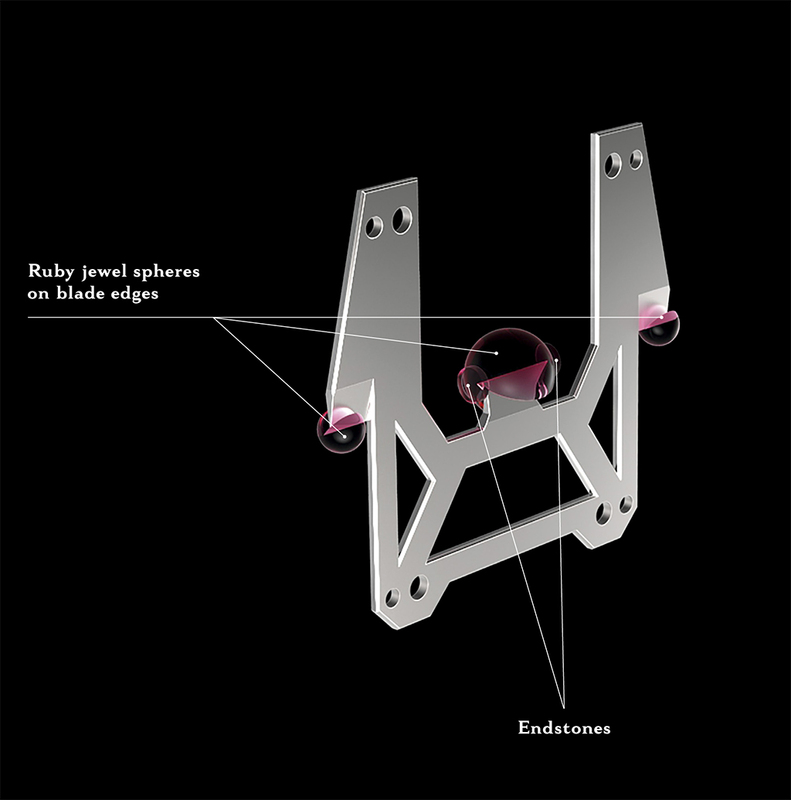 In this article, we will attempting to describe how the escapement works. New data released by Dominique Renaud just came to light, but as earlier mentioned the information is scant, and the language obviously translated from French, and is a bit difficult to understand. We found the video which we will include here to be informative. The blade oscillator. The pivot of the balance is shrunk into a much smaller cylinder, which is fragmented into three parts, and displaced to make contact with the blade at two sides and the center. The entire blade is attached to a cylinder which acts like the balance wheel. This device is cylindrical, unlike the traditional circular balance wheel. The “balance wheel” and the escapement system comprising of a single impulse detent type escapement system. The blade is tensioned at its pivots. In the DR01, a set of crossbow shaped resonator spring is used. This can be seen at the side of the rendering below. But Dominique tells us that the design allows for the spring to take any form or length. And in future implementations, elements of the escapement may be changed in order to modify certain parameters. For instance, the number of lost beats, the impulse and the beat frequency can all be changed in synergy with each other. The crossbow shaped resonator spring is seen on the left, at the edge of the cylinder. The fine adjustment system is also seen on the far left of the rendering, connected to the cross-bow resonator spring. The effective length and tension of the spring can be changed. As the balance receives each impulse, it is pushes the blade in one direction, causing it to move, and the tension on the cross bow resonator spring to increase. The tension slows the impulse, stops the balance, and returns it. As the balance has inertia, it swings past the neutral point and the blade tension then acts in the opposite direction, causing it oscillate about the neutral position. The escapement system then provides each impulse to keep the oscillation going. These small pivots are unbreakable, and can receive a heavy balance of small diameter. The escapement impulse point is placed on the periphery of the flywheel, and reduces the lift angle of the balance. The amplitude of the balance is about 30 °, as the balance will knock at about 80°. This gives the balance an angular working sector of about 60 ° The traditional balance wheel’s amplitude is about 275° and 315°. this low amplitude of the blade resonator allows a system which can vibrate at high frequencies with low energy consumption. In this case, the resonator vibrates at 36,000 bph. And the initial calculations show that this will provide a power reserve of approximately two weeks on a traditional simple barrel. Additionally, the system is set up as a coup perdu (English translation – lost beat) system. This system is not uncommon in clocks. In a clock with a 1/2 second beating pendulum, the system is set up to directly control an escape wheel at the rate of a one second pendulum, so only every other beat is registered by the escape wheel. Hence the ‘lost beat’ moniker. 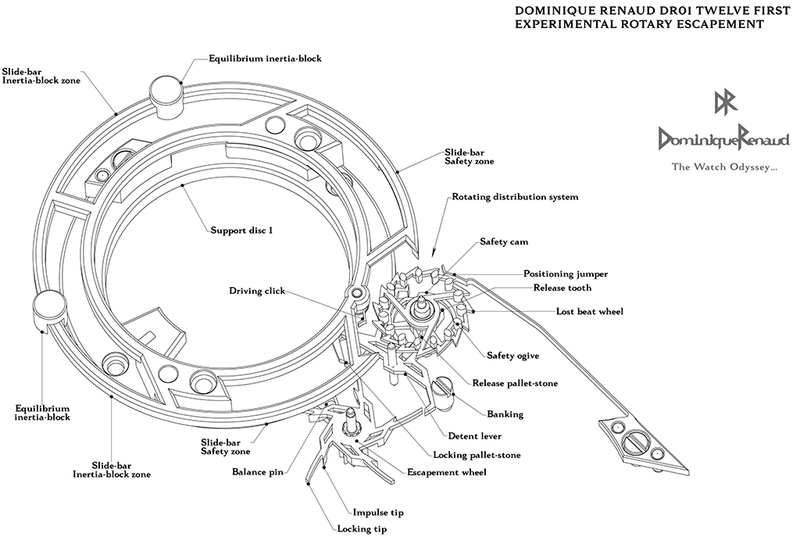 In the Dominique Renaud escapement, this is set up such that there are 9 lost beats to each impulse, and given that the escapement is running at 36,000 bph, will translate directly to one impulse per second registered by the escape wheel. This is used to provide a true seconds morte which is derived from the escapement itself, and not by an additional device such as a remontoire. The implementation as per the drawings show a very large blade, but Dominique tells us that this is done to highlight the concept and facilitate development. The system can be reduced in physical dimensions without affecting its performance. Where is the DR01 now with regards to the development? This is rather exciting. And as we mentioned in our earlier article, all that we have seen is theory. Calculations, drawings and renderings. No photographs. To date, even proof of concept prototypes do not yet exist and is still under development. But the development of this new system is rather interesting, and can revolutionize the industry. What have we to go on? Only Dominique Renaud’s known genius in the industry, and his reputation. We watch with anticipation for the proof. What got us thinking also is that this type of thinking is rather unusual in watchmaking, which traditionally takes on a more experimental and hands-on approach to new concepts rather than a theoretical approach that Dominique has chosen. It seems to us, watchmaking, at least as far as this new escapement is concerned, is taking a leaf from Physics, where theoretical thinking (like the work of Albert Einstein in the turn of the century and like Stephen Hawking still does today) is often years ahead of emperical proof from the lab. We live in interesting times indeed.